Yeah, ok, I admit it. I'm a Jillian Michaels fan. Yes, she yells but - as she says (and there is living proof in the form of a whole lot of former Biggest Loser contestants) - she gets results. When I was offered a chance to review The Master Your Metabolism Cookbook I leapt upon it! I've never read any of Michaels' books (mostly I just like to watch her on tv) so I thought it would be interesting. Not to mention, I love to cook and bake and checking out some new recipes, all approved by Michaels, would be fun. 1. "The What and the Why" - an explanation as to why you want to eat and not eat certain foods. She talks about biochemistry and power nutrients. That's one thing I really like about Jillian. She explains why you are supposed to be doing whatever she says as she goes along changing your lifestyle. Tremendously helpful and it takes the edge off of the way she sometimes speaks. "Do this because it's good for you in this particular way!" I like that. It makes sense of the recipes she then provides. 2. Menus - she provides a menu plan for the recipes included in the book. 3. The recipes. The thing that I most appreciated about the recipes (besides the fact that they are tasty and healthy) is that she marks what benefit is to be gained in eating each dish. The health benefits are clearly marked at the top of each recipe. Health Benefits: Heart Healthy, Boosts Metabolism, Improves Mood, Digestion, Strong Bones, Healthy Skin, Miscellaneous. Use your fingers to shred the chicken into a large bowl. Add the grapes and pecans and toss gently to mix the ingredients. In a small bowl, stir together the yogurt, celery, honey, vinegar, salt and pepper. Pour the dressing over the chicken and toss to coat. Store the salad in a tightly sealed container in the refrigerator for up to 3 days. Let stand at room temperature for about 15 minutes before serving. To make a sandwich, toast the bread, if desired. Place 1/2 cup chicken salad on 1 slice. Top with the lettuce leaf and the other slice of bread. Slice in half and service. As I said, this recipe was a hit (although I didn't include the celery because I don't like it - possibly eliminating one of the health benefits, eh?) The yogurt gave it a kind of sweetness and with a slice of bread from our local bakery, this meal was totally filling and 100% satisfying. I liked the fact that it didn't feel as creamy and heavy as mayo typically makes dishes feel and now I'm experimenting more with Greek yogurt in our everyday recipes. There are plenty of recipes available in The Master Your Metabolism Cookbook from chicken to fish, side dishes and yes, even desserts. If you are interested in changing your diet and eating healthier fare, then this is definitely a book to pick up as she explains why you want to be eating this way to begin with. Because I'm on a Jillian kick and because I can cave to peer pressure just as easily as the next person, I'm also doing Jillian's 30 Day Shred video. I'm currently in the middle of a challenge with a friend of mine to see who can actually complete all 30 days. Stephanie is also doing the video and so we've been commiserating a bit. Heh heh. So far I'm stickin' to my end of the bargain because a Borders gift card is on the line! ;D (Nothing like a little incentive!) Wish me luck! Lastly, as another little way to "KEEP MOVING!" 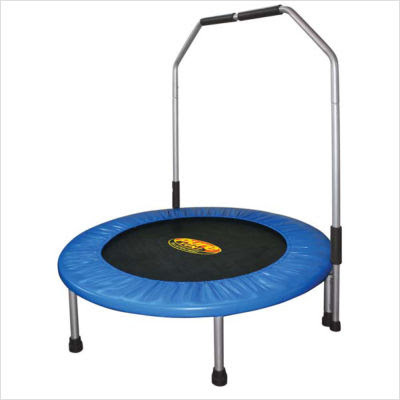 as Jillian recommends, I accepted for review a Pure Fun Trampoline from CSN stores.com. It just arrived the other day so this morning the boys and I tested it out. We took turns bouncing around and, my goodness!, it's much easier to pull of jumping jacks on a thing that bounces back as opposed to the cold, hard ground! The boys both enjoy the idea of a mini trampoline, of course, and I would say it's not half bad. I appreciate the fact that it has a hand rail as my 3 1/2 year old really likes to put the trampoline through a workout and it's nice for him to have something to hold on to. As for myself, I think that the trampoline is not quite as springy as some others I've tried, but it still does the job it's designed to do quite nicely. It's a great little thing to stick in front of the television (or, in my case, the computer screen where I watch Jillian via hulu.com) and to get in some movement when you would otherwise be vegetating. This item was a good pick for me and I've no complaints. Thanks to CSN stores for the trampoline, Crown Publishing Group for the book, and Jillian Michaels for the entertaining inspiration, Greek Yogurt, and peer pressure, this has already proven to be an interesting summer. Recipes to share? Check out our Recipe Swap over at Offering Hospitality today where people are sharing good picnic foods. I've seen a few non-Jillian approved items that I know I'm going to try anyway. But it will balance out, right? If I jump on the trampoline long enough? I am in the middle of reading that cookbook from the library. It's pretty good. Although I disagree with her low fat diet. That recipe is one I want to try, but I'll use full fat yogurt. I also really like Jillian. I'm in the middle of the 30 Day Shred, too. I stopped for a week, and started back today. Oh.my.goodness! It was HARD. I bought The Biggest Loser Power Sculpt to alternate with the Shred. That's helping with my knees. I think I NEED that book!! I don't think I'm a fan of Jillian but I am a fan of the results she gets. I'm down 6 pounds thanks to 30 day shred. Now I'm trying to figure out what to change in my diet and how to cook for us all with healthy and inexpensive food. I don't watch tv, so I've only had very minimal exposure to Jillian whats-her-name (on the tv at the YMCA where I used to walk on the treadmill long before the DLM was born). However, I am in dire need of losing a little weight, so I might have to check out some of her stuff. That chicken salad looks yummy! I'm going to give it a try. Hmm... 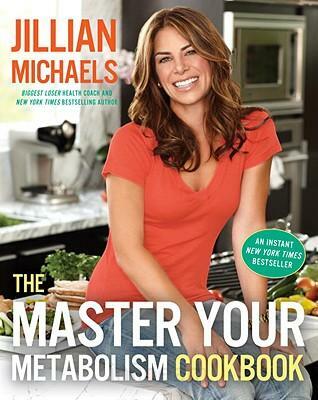 It's interesting to me that what you like about Jillian is what I DON'T like about a lot of diet and nutrition "experts"--the emphasis on eating "in order to do x or y for your body."